A rebel victory is looming on the horizon when the Imperials abruptly change tactics and, in a surprising show of devastating force, incinerate the city of Dallas with a thermonuclear blast - killing millions - and delivering a merciless example of what happens to upstart worlds in the Pax Humana. But the Resistance will not be cowed so easily. In retaliation the rebel leadership devises a daring plan to strike at the Empire's heart in a final, desperate bid for freedom, a plan that will put Jake Mercer in the captain's chair of the most advanced warship in the galaxy. In a life full of crazy moves, this one might just be the craziest, but Jake jumps at the chance anyway for it means a possible end to the war. To succeed, all Jake has to do is face down a psychopathic Imperial Admiral bent on utterly destroying the Resistance and even Earth itself. What could be so hard about that? Rebels vs an Empire in space. Fairly quickly I thought of Star Wars. And this book (series) may get some comparisons of that nature. It just can't be helped. But there are many many differences and once you pass the initial 'empire vs rebels' element they aren't that similar. Within the first 20% of the book I had decided I was going to put the rest of the series into my wish list. Alas, the rest of the series is not currently available as audiobooks. The book starts begins with a space battle, following fighter pilots fighting among the capital ships. I thought I might have something to fill the gap left by the completion of the Stackpole/Allston X-wing book series. However the book eventually moves away from the individual fighters and pilots and focuses back on the capital ships, as our hero moves from fighter pilot to bridge crew. What begins then is less "seat of your pants" dog fights and more of a chess match between two fleets of ships. I personally enjoyed the initial part more, but this is not to say the later parts with the capital ships are bad. They are certainly interesting and left me wanting more. The narration by Tremblay is really good. Narration is simple, clear, well paced and carries the right inflection to convey what people are feeling. Characters are distinct, with a variety of voices and accents provided. Webb and Tremblay: get onto making the rest of the series as audiobooks. i will pick them up. Space "TV series" with excellent narration! Meet Jake "Shotgun" Mercer, the main character. He is a reckless fighter pilot in the Resistance movement of Earth battling the Corsican Empire which expanse over 600 planets trying to force the Pax Humana way of life on everyone. Basically, think the Allied forced versus the German Empire in World War 2, with a sprinkling of Battlestar Galactica thrown in, if you're familiar with that. This is a classic classic good versus evil, except in space. There's lots of action (pew-pew-pew), things going right (yay! ), things going wrong (very wrong), technical talk (*scratches head*), some sexual tension (please, give me more), friendship (*fist bumps*), treachery etc etc. It's like a TV show, with good secondary characters, engaging story and great dialogue. The character cast is pretty big, there are a lot of people here, but I didn't feel overwhelmed much thanks to Tremblay's excellent voice cast. I mean, he has a different voice and accent for each of the characters, and he effortlessly flitted between them in dialogue. I'm very impressed! The point of view shifts between several of the characters. The story also flips back and forth between Jake and the others with the Resistance, and the captain aboard the Imperial ship giving a view of the bad bad guy, the Admiral Tra,jan who is a brilliant (and madman) tactician who wants to see the Earth Resistance crushed once and for all and no matter the cost. The story doesn't end on a cliffhanger per se, but it is a story continuing in book 2, Chain of Destiny, so don't expect any solution in this book. I highly enjoyed this fast pasted story, brilliantly narrated by Greg Tremblay. He made the book come alive, and I'm very sure I enjoyed the book more because of it. I have the voices of Jake and Anya, Admiral Trajan and all the others is my head now. On to the second book, Chains of Destiny! 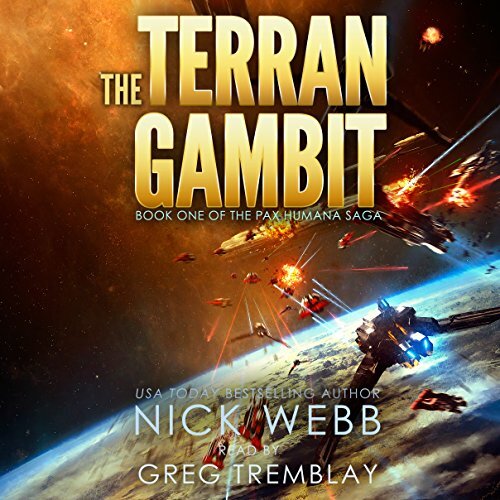 I love military scifi and space operas both, and I felt that The Terran Gambit was an excellent mix of the genres. The story is engaging from the beginning, jumping right into the action and military conflict. The setting unfolds naturally instead of giant info dumps, but at the same time the core of the lack of back story made the overall conflict a little muddy to me. I loved the characters and Greg Tremblay did an excellent job of giving all of them their own unique voice and wide range of accents. I'm excited for the next book - hopefully in audiobook format! The book didn't grab me right off. In fact I listen to 2 other books. It's ranks as a standby series for me. A book between others. But in going to start the second one see where it goes. I had a charge show up on my account as a purchase I made for the 'kindle audible' product, when all I did was select a book to READ on my 'kindle unlimited' account. Since there is no clear and easy manner to cancel this erroneous order on your website, this appears to be my only forum. I consider what was done to be well below the quality of my other relationships with Amazon, I must use this as a forum to protest the marketing and 'customer service' of the Kindle Audible organization. There is NO clear process to revise this charge from my credit card. Has anyone else had a similar experience? I enjoyed this book Nick web does not disappoint. I liked the imaginative fast pace. Where is the rest??? Beware! I followed all three of the pax humana series on Audible...loved them all only to discover that this is not a trilogy but a continuing series! Book three left me with story threads not resolved because there are more books not available on Audible. Please Audible get the complete series! I listen to Nick Webb's books on my 2 hour drive from seeing my kids on my supper night and after dropping them off from the weekend. I can get lost in his books. As an avid Sci-Fi fan, I find his books follow the vein of using science fiction to tell about the human experience and what that entails. Anyone who has read/listened any of Nick Webb’s stuff knows he writes brilliant Military Sci-Fi, laced with interesting bits of physics from his own background to give the story some realism, as well as some of the most incredible tech, weaponry and starships. Add to this exceptional Character writing, Narration by Greg Tremblay, and you have a story that you are just not going to be able to stop listening to - and will want to re-listen to again. Terran Gambit starts with the crushing of a small rebellion that has risen up against the Empire of the Pax Humana, before moving 3yrs into the future. It is here that the main story continues, and we follow several main characters. I don’t want to give away any spoilers, but with that said, the story focuses on Characters within a rebuilt Rebellion, and some within the Empire itself. Nick has developed an awesome backdrop to work against, with a Universe that has been conquered and is run by an Emperor, and this small Rebellion is determined to free Earth from the clutches of it. It might sound like there are some linkages to Star Wars here, and I guess in some aspects there are (Rebels, Empires, Space, Starship battles, good and evil…), but that is about it really. There are some exceptional Characters in this book, one of Webb’s strengths is his Character writing, developing strong detailed stories for each of them, making them interesting and believable. You can’t help but laugh yourself stupid at some of them, cringe at others, and support a few as well. Tremblay does a brilliant job (as always) of bringing these characters to life, making this an exceptional Audiobook, and a great way to absorb Nick's work. As mentioned earlier, another strength with Nick Webb is his scientific background, which allows him to produce some brilliant bits of writing in a Sci-Fi book, creating new tech, theories, or explaining real life possibilities in lay-terms so the reader can understand some cool technology, weapons or new bit of equipment for the ship or soldier. Nick is always coming up with new and interesting ships and weapons in his books, not only adding creative ways to destroy each other in battles, but allowing us to understand and enjoy it as well. This was an outstanding start to the series, between Nicks writing, and Gregs narration, this is just exceptional and should not be missed - I am already into the 2nd part Chains of Destiny. there wasn't much of a story here. however I will proceed with at least the next book in the series as the potential is high. Good character development and foundation laying.